I hesitate giving this posting from the League of the South, announcing their intention to celebrate the 150th anniversary of the assassination of Abraham Lincoln, any more attention that it has already attracted, but it is useful in making a couple of points. The League of the South looks to the present and future. However, from time to time we do look back at our past. This 14th of April will mark the 150th anniversary of John Wilkes Booth’s execution of the tyrant Abraham Lincoln. The League will, in some form or fashion, celebrate this event. We remember Booth’s diary entry: “Our country owed all her troubles to him, and God simply made me the instrument of his punishment.” A century and a half after the fact, The League of the South thanks Mr. Booth for his service to the South and to humanity. First, it betrays a rather naive understanding of how Americans (North and South) responded to the actions of John Wilkes Booth. Two recent books by Martha Hodes and John Barr reveal that the assassination did not unite all white Southerners in celebration and it certainly did not reflect how millions of black Southerners felt at the time and beyond. I think it’s safe to say that Mr. Hill’s reference to Booth’s “service to the South” was not meant to include African Americans. My point is that media outlets ought not make the mistake in interpreting the League’s announcement as necessarily reflecting a certain regional or racial identification (past or present) with this important historical event. Apart from a few select examples, I am suspicious of people who identify this strongly with an event that took place 150 years ago. Guess what, this event didn’t involve you. If the celebration is intended to capture what joy there was in certain quarters over the president’s death than you probably need to do some soul searching or even have your head examined. In the end, what this announcement amounts to is downright hatred and a rejection of our political system. Regardless of how one feels about an elected official we are lucky to live in a system where we can voice our opposition through voting and civic action. I don’t think we should make much more of it than that. These people are despicable ! These people are just plain sick. It’s one thing to deny defeat for 150 years,but to celebrate murder is truly horrifying. Ummmm Yeah,,Lincoln Needed Killing..But That said ,His death Also killed His Plan To send ‘Black’People back to Africa…Which in turn would have showed his Real Racist Colors,Which in turn Might have Showed the World that he WASN’T ‘Christ Like’ as He is Portrayed today! For someone who is worried about the Lincoln of myth you certainly don’t have a firm grip on the relevant history. By the end of the war Lincoln had pretty much given up on colonization. That said, we would do well to remember that he did continue to push for colonization at least as late as the end of 1862. There is a relatively new book out that suggests that it may have been considered later in the war, but certainly not into 1865. Lincoln’s views on race also underwent a transformation from his earliest years, though it is likely that for much of his life he held to the standard racial outlook, which would be considered racist by most Americans today. Eric Foner’s book, This Fiery Trial, does an excellent job of tracking this evolution. I will not respond to your support of the League’s position, but I do appreciate you not hiding behind an alias. And if you think about it Booth did the man a favor because Lincoln was almost always really depressed so much so that one of his friends said that he was the most depressed man he ever saw. And when Booth shot him he was already dying. And I don’t think that Booth should have used the gun that he used because it made him suffer and linger for a night. Lincoln’s bouts with depression are still debated by historians, but I am sure that people struggling with clinical Depression will appreciate your comment. Downright sick. Personally, I think Hill is just trying to create publicity for his group. No one cares about the League of the South, so I think he’s just trying to attract attention. The contemporaries of Abraham Lincoln and the American citizens who personally mourned his death should be the voices we apply to how it affected their lives. Not a group like these people who prefer to make a hero of his murder. Johnston served in many business ventures, and later as a U.S. Congressman he died of pneumonia in 1891, which he contracted at General Sherman’s funeral where served as a pallbearer. When ask why he stood in the rain at the funeral, Johnston replied, he would have done it for me. War we will see that they did not harbor hate against each other. . This is just another publicity stunt by this group to bring attention to their hate filled agenda and to get more people involved in all these “The South’s Gonna Rise Again Groups”. The writings/speeches of Confederate veterans reflect a much stronger patriotic view than anything coming out of the LoS. I agree with you completely that the vitriol expressed by some southerners was very genuine and as historians we ought to do our best to understand it, but expressions of anger and hate 150 years later are disingenuous. They sound like people who would have you believe that there own personal property was destroyed by William T. Sherman. I can suggest that if those veterans ( i.e. Johnston et. al.) had the benefit of seeing what was yet to come, they would have had a markedly different opinion. I will suggest that your statement about Sherman is wicked and inhuman. I wonder if you would make a similar statement to a descendant of Jews whose property was stolen or destroyed by the Nazis? If you disagree with that line of logic, please explain. My apologies in advance for the spelling and gramma errors, I am posting from my iPhone! Of course, you can suggest all you want, but that doesn’t change the fact that many Confederate veterans would likely be appalled at the actions of the LoS. However, as I already pointed out there is no reason to believe that the LoS ought to be seen as having anything to do with a Confederate view of the war. It reflects the members of that particular organization. I will suggest that your statement about Sherman is wicked and inhuman. Not sure what is “wicked or inhuman” about my claim. If you can document cases along the lines of those that have been made by Jews and enforced by legal authorities than I would like to see them. In other words, please identify those still living Confederates or their children who continue to suffer as a result of stolen or destroyed property. Thanks for the comment. While this group, and groups like it are truly despicable, time is literally against them. You look at the LoS and its LoSers and it’s, for the most part, a bunch of old white guys. 15-20 years from now, when old age finally takes them to whatever place they’re going, the World will finally be rid of this lunacy. There is nothing surprising in Dr. Hill’s observations, as they merely reflect the Confederate view of the war. That Abraham Lincoln is the natural object of profound and inveterate Confederate antipathy is perfectly logical; he was their enemy. The Confederate States withdrew their consent to be governed by the existing polity. That’s it. And for this harmless and innocent act, Lincoln waged a ruthless and brutal war against them, causing the financial loss of millions upon millions, and far worse, the violent and premature deaths of over 250,000 of their sons. So yes, there is lingering bitterness and overt hostility directed toward the man responsible for all that senseless death and destruction. Again, it is hardly surprising. I hate to break it to you, but there are no Confederates alive today. The Confederate government also no longer exists. Unless I am mistaken demonstration of Confederate ancestry is not a requirement for joining the LoS. In other words, they don’t speak for anyone or anything beyond the members of their organization. As I stated in the post, anyone who embraces this sort of bitterness 150 years later needs to have their head examined and that is putting it kindly. I am puzzled, very puzzled indeed, by your hostility toward those with an interest in historical events. After all, the Battle of The Crater was fought over 150 years ago, and you not only wrote a book on the subject, but still gives lectures on that event. And the subtitle of your book, “War as Murder”, undoubtedly expresses a severe censure which could easily be characterized as bitterness. Care to explain? You apparently have not read my book about the Crater. It is a work of history and not, in any way, an expression of bitterness. This is a shrill, desperate rearguard action from a group who has isolated itself more and more from the mainstream of this nation by repugnancies such as this. The LoS has no bearing on national discourse as most of America has moved on from the ideas the LoS is selling in the course of 150 years. Any attention the LoS receives from this event will be scorn and derision, I guarantee and hope it will backfire on these buffoons. This is an act of derangement, no more, no less. In celebrating the murder of Abraham Lincoln they’re celebrating a cowardly act that hurt the south almost as much as the planter classes decision to secede in the first place. Lincoln was the best friend the south had at that point and his death was a national catastrophe but especially a southern one. This will be a commemoration of the most brutish, thuggish act of cutting off one’s nose to spite their face in American history. The assassination of Abraham Lincoln was as out of keeping of this nation’s principles as it was cold-blooded. This tells us all we need to know about the League of the South. It’s nothing but derangement and delusion that they think anyone cares what they think. Btw-I wonder if Michael Hill will dress in drag on May 10 to memorialize the 150th of the capture of Jeff Davis? I’ve been thinking about your ending paragraph for the past few hours in terms of secession itself, and how that was a rejection of the executive, and the will of the people in 1860 that led to the election of Lincoln. But that, in some ways, is making too tight of a connection between this planed “celebration” and the Civil War, since poking around on the LoS web page makes their rejection of the United States of America, with violence, much more explicit than my musings, as Hill wrote on Tuesday of this week: ” I do not intend to leave Alabama or the South. Nor do I intend to leave them in the clutches of America. I intend to fight, and if necessary kill and die, for their survival, well-being, and independence.” The LoS is an institution that claims to call for the destruction of the United States. Why wouldn’t they celebrate the murder of an important saint in our civic religion? Kevin Levin, I believe that your missing the point that what the League seems to stand for (Southern Independence), is the very thing that Lincoln waged a war against the southern states over, but not only are these feeling accumulated over that reason, but there also accumulated over the near fact (that I’d stand to bet) that over 99% of those in the League can trace their ancestory back to those men who fought against Lincoln’s invasion. Today, I’d say that those that are in the League realize that they live in a land thats occupation is credited to Lincoln. I believe that your missing the point that what the League seems to stand for (Southern Independence). . . . According to Hill himself (April 22, 2014), the League of the South advocates southern independence to protect “Mr. & Mrs. White Southerner” from the growing political influence of “blacks, Hispanics, Jews, etc.” As I said elsewhere in this thread, I appreciate Hill’s candor, and hope that he continues to make clear exactly what he and those who align with him stand for. Where did I suggest anything about denying their right of free speech? I commented on the content of their announcement, which cuts directly against our system of government. I didn’t say you said anything about denying free speech…I was saying that they have the right to celebrate the assassination of a President (which is about as horrible as something can get). Their right to do so is protected by our political system. They want to secede…so does a dozen other groups across the country that are on the fringe. Kevin, your PC opinion aligns with Reconstructed Southenors. Lincoln was a tyrant and execution was his due. If we supposed to like ol abe just because he was a president are to like huntin weapons mass destruction? Just get along an crawl in bed with any and everything. Lincoln was never President of Alabama. He was not even on the ballot in Alabama. If we supposed to like ol abe just because he was a president are to like huntin weapons mass destruction? I never suggested that you had to “like” him. Certainly, many white Southerners and some Northerners who lived through the war believed that Lincoln was a tyrant. Why you feel outrage 150 years later is a mystery. You never suffered. Thanks for the comment. Not that I am going to celebrate his murder but you ask how have I been affected, we will never know how we have been affected I lost ancestors so how many cousins would I have had, or we will never know someone who was killed might have discovered the cure for cancer or some other diseases how many great artists were killed that we were robbed of their work. There is no way we can ever know what we were robbed of by that war! So then it’s possible that you didn’t lose anything. As I said I lost ancestors so yes I lost something and there is no doubt that this country lost great men who could have done great things so yes we all lost! You could make this argument about any number of past events. For what it’s worth I am sorry for your loss. Mr. Williams, I have one question for you. If our United States was envaded by an enemy outside the U.S. would you fight to protect it??? Fine by me. It’s important to know what Hill and the League of the South stand for, and what they believe. Having their head examined is a good option but it’s probably more in the nature of a publicity stunt to try to cause shock and consternation. I was also wondering why they made the announcement before making any plans, and then I realized that it was posted on Thursday, and of course they had to make a statement that they celebrated his death on his birthday. Of course. Why do you persist with the peculiar idea that because certain acts and events occurred in the past, those in the present are not permitted to feel a sense of moral outrage at the injustices perpetrated by those acts and events? Does this principle apply to slavery as well? Because I routinely see comments which express outrage at the injustices which occurred in connection with slavery, and I have never once seen you harangue those persons with sharp criticisms telling them that since slavery occurred over 150 years ago, there is no cause for complaint. I don’t believe I have ever read a comment in reference to slavery that involved the celebration of a murder. That said, I may have missed such a comment. Please provide the reference. More to the point, perhaps you could explain where your outrage (assuming you are) stems from 150 years later. If not, what in your view would justify an individual or group celebrating the murder of an American president? Do you think, for example, that it is inappropriate for Chinese persons, wherever they may live, to celebrate the death of Iwani Matsui? Abraham Lincoln ruthlessly, cruelly, and needlessly inflicted death, destruction, and suffering on a people whose only “misdeed” was a desire to seek political independence. That he is viewed by them as dark-hearted, monstrous, nefarious, evil, and sinister is perfectly understandable. You seem to be missing my point. Of course people have a reason to express anger for the deeds of the past when it can be demonstrated that they have been effected in some degree. What I am wondering and what you seem to be avoiding is on what basis the League of the South is justified in celebrating the death of an American president. We know that plenty of people who lived during the war expressed anger at Lincoln. Some even celebrated his assassination. We can make sense of that anger as part of the broader historical event. Once again I ask on what grounds you believe it is justified to celebrate the death of an American president 150 years later. It would appear that Kirk Lyons and the Southern Legal Resource Center are trying to get in on the action as well. There is something incredibly childish about it. Sherry Lee above may be on to something. This is the last year of the 150th and this may be both organizations last grasp at relevancy during that time. I wish I could agree with Ryan Q above – that this will eventually just go away – but we’re at 150 and counting. When I was working on my first book, I went to the site of the Garrett Farm. I expected to find only the VA historical marker that I knew was there. I was stunned to also find, in the median, a stone marker that read: “Let your peace fall upon the soul of John Wilkes Booth – The Twenty First Century Confederate Legion”. This was six or seven years ago. Apart from a few things I’ve found online about this group through my own efforts, I haven’t heard a peep about them. It’s nice to think that groups like the League of the South and the SLRC will eventually talk themselves into oblivion. But I don’t hold any high hopes that the undercurrent will ever disappear. So which is worse, I wonder – knowing that (relatively) large fringe groups are out there making disturbing public statements like this, or not knowing that smaller, quieter fringe extremists are lurking in the background and perpetuating these myths, even among a very tiny population? I completely understand your hesitation in posting, Kevin. On one hand, one doesn’t want to give them the recognition. On the other, ignoring them would be at our own peril. Mr Levin says, “I am suspicious of people who identify this strongly with an event that took place 150 years ago. Guess what, this event didn’t involve you.” Hmmm…. does this include those vitriolic defenders of ‘the union’ who spew their venom at Southerners to this day? Like, perhaps, YOU, Mr Levin and a host of the commentators here? You are correct on one point, the events of 1861-65 did not involve me, but they involved those whose blood runs through my veins. And just as importantly, the results of those events have a DIRECT impact on me, my fellow Southerners, and my posterity. Everything is fine, in your mind, because the outcome and results are to your liking – principle and justice be damned. The rest of us should just shut up and like it. Well, there’s a certain part of my rebel anatomy that you can kiss, sir. You also state that, “In the end, what this announcement amounts to is downright hatred and a rejection of our political system.” Correction. It is a hatred of YOUR system, i.e. the yankee empire, that motivates those of us in the Southern nationalist movement of today. OUR system was crushed under the heel of u.s. invasion and subjugation. We simply want OUR system back and to be free from yours. I don’t understand the objection to this on the part of those like you, Mr Levin. If we of the South are such a drag weight and impediment to your marxist/socialist utopian plans for the u.s.a., then it would seem you’d be glad to be rid of us via our independence. Why does the yankee empire, whose mind is so fixed upon its money, want to squander so much of it on us poor benighted knuckle draggers? Especially when we are such a pain in the neck? You people must be crazy. What other explanation is there? It’s nice to hear from a member of the LoS board. Beyond reminding you that the LoS speaks for no one beyond its members, I thank you for confirming many of my suspicions outlined in the post. Thanks for taking the time to comment. As I said with Michael Hill, it’s always refreshing to know where League of the South members stand on important issues. 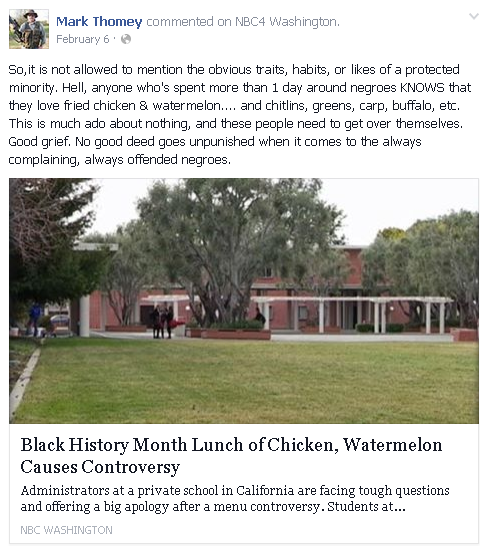 Please don’t hesitate to continue sharing your views about “negroes” [sic. ], fried chicken and watermelons in the future. People need to know exactly the sort of folks the League of the South is composed of. One poster noted that the War may have robbed us of people who may have contributed positively to society. Although that may be true it is hard to say how and, at best, it’s all speculative. Moreover, when you take certain actions, consequences will entail and it is always good to remember that. Exactly. I could speculate on the costs to Indiana caused by the Rebellion, which were magnified here along the Ohio River because of the loss of trade to the south, as well as economic costs of the invasion led by John Hunt Morgan, but, one of the state’s major companies, Eli Lilly, was founded by a veteran whose received valuable leadership during the war. It’s a question that can’t be answered, and the state can’t ask for compensation, as justified as that might be, from the Confederacy anyway, since it no longer exists. A while back there was a posting on Facebook from a young man from Georgia, wanting to know exactly the route of Sherman’s March. His ancestor had been a wealthy plantation owner, he said, and he believed the ancestor had been wiped out by Sherman’s bummers. He was speculating that his family’s financial woes today, in the 21st century, were somehow connected to that, and he wanted to hang the direct responsibility for that on Sherman, personally. It turned out that his ancestor — who actually appears in the 1860 U.S. Census as a farm laborer with no assets listed — lived nowhere near Sherman’s line of march. But more generally, that sort of thinking infuses a lot of Confederate Heritage™ today, consciously or otherwise. People are unhappy about whatever they perceive as wrong in the world around them, and see the genuinely profound upheaval of the American Civil War as sort of the point where everything went “wrong,” from their perspective. If only Lincoln had not been elected, if only the South had been able to secede in peace, if only Lee had broken through the Union lines on the third day at Gettysburg. If only, if only, if only, everything would be fine now. Excellent point. It reminds me of the ridiculous arguments for reparations. If only my great-great-great -great whatever hadn’t been a person held to service. I’d be a multi-millionaire trading credit derivatives, or perhaps a Wall Street investment banker. If only, if only, if only…. Indeed. Who can say, withy any degree of accuracy, what the cost was of human potential that would never be realized as a result of the Slaveowners Rebellion of 1776. And the same principle applies to the citizens of the CSA who withdrew their consent to be governed by the USA in 1861. There is just no meaningful way to account for the losses. This isn’t much to hang the kind of faux outrage expressed by the LoS 150 years later. So, are these people traitors? Do they condone terrorism? Obviously YES, by their own words. This puts them in the same category as the klan or the nazi party in my opinion. Not worthy of attention except by the FBI, DHS, CIA and anyone else who keep an eye on them. “Saturday, April 15. Heard of the diabolical assassination of president Lincoln, Mr. Seward & son. I sincerely deplore the President’s death.” (Col. William Lamb, “Hero of Ft. Fisher”). And what did other Southerners think about the assassination? E. P. Alexander didn’t exactly mourn the president (he was more concerned with not being lynched in Washington during the funeral), but he didn’t approve of the murder either. He felt that the assassination cheated the South out of receiving financial compensation for emancipation and caused Reconstruction to be harder. “Had Mr. Lincoln not been assassinated, some compensation would have been made,” he wrote. Instead, the South suffered “all the iniquities of Reconstruction under the passions engendered by the assassination.” (“Fighting For the Confederacy,” 1989, page 503). Michael Hill’s statements reek of presentism, and do not reflect the diversity of actual Confederates.